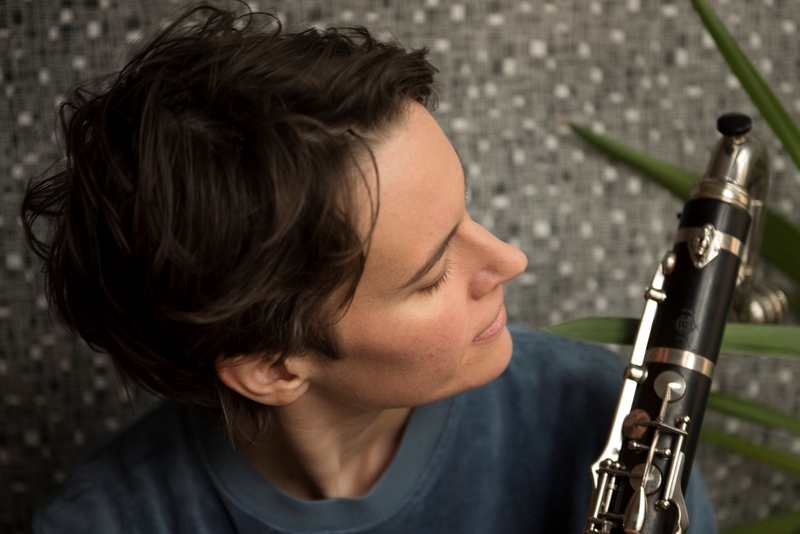 Susanna Gartmayer studied painting and printmaking and is self trained in bass clarinet and composition. She is part of many ensembles of elusive musical genres, for example the experimental rock band Broken.Heart.Collector or The Vegetable Orchestra (music for instruments made of out of vegetables). She participates in SHAPE with three different projects. Gartmayer’s live show, based on the album AOUIE, is played without amplification. She exhibits the same attention to detail – the setup for each tune is slightly different, taking into account the way the audience is sitting as well as venue acoustics and the playing position she wishes to adopt. As one of the SHAPE artists, she will play at the upcoming Musikprotokoll festival in Graz. You studied painting and printmaking and taught yourself bass clarinet and composition. Can you talk about your journey to music and music-making? Playing music has always been a very important part of my life. As a small child, I already improvised on the recorder and in my youth I started to play saxophone. I couldn’t really unite with my teacher for a musical style we both liked, so I played classical music on sax… I never stopped practicing during my art studies. Two years after my graduation, in 2002, I had a very big “art crisis” (regarding the reasonableness of fine art), so I decided to start my own bands, since the question of meaningfulness of music was and is not bothering me, music is necessary – period. Already then it was clear to me, that I needed to have more than one band to unite my extremely eclectic musical interests. My very first bands after 2002 where: the experimental chamber music trio “Splitter” (with accordion and violin) and the experimental rock band “When Yuppies Go To Hell”, playing a rather aggressive, loud and juicy music. At the same time I started to write or rather assemble – veeeery slowly – my own pieces for these bands. I then took private lessons for saxophone, bass clarinet and composition with some inspiring musicians (Petra Stump, Gerald Preinfalk, Michael Fischer, Peter Herbert). I started to play at free sessions, where I dealt with my stage fright and met a lot of musicians that became colleagues and friends. And then I became part of The Vegetable Orchestra and started to play concerts all around the world. And, most importantly, in 2004, I finally found THE instrument of my choice, bass clarinet…. You have been involved in various projects. Can you talk about them? My present rock band is called Broken.Heart.Collector”, including all the members of the wonderful trio bulbul (raumschiff Engelmayr – guit, Didi Kern – drums, derhunt – bass) and the great Slovenian singer/paetzolt flute player/electronic musician Maja Osojnik. It’s a blast to play with them, all of them being very versatile and free musicians. Then theres my trio Möström, with wonderful Tamara Wilhelm on her self built DIY electronics and Elise Mory, playing the keyboards. Our music sometimes seems to me like a manic-depressed teenager, I love to dive into the lunatic sonic possibilities of our special instruments. And I love that humour is a very important part of our music! I also love my “last remaining” improv band with Dieb 13 on turntables and drummer Katharina Ernst (Gartmayer/Ernst/dieb13). With them, I’m confident in finding extremely diversified music together, powerful and tender, odd and challenging. In my duo with Brigitta Bödenauer, on electronics, where we musically work with polyrhythmics and rather sparse abstract structures, I may finally act out on my interest in playing with roles and the appearance on stage – since costumes and staging are part of our performance. And then there’s The Vegetable Orchestra. The Vegetable Orchestra is based around a simple idea – vegetables become instruments. Can you talk about the project and how/whether it inspired you in your other work? I would say, The Vegetable Orchestra is based on the idea that you can make music and art with everything! Only shortly after they started – their very first show was meant as a satire of classical orchestras – they realized that serious music is really possible with vegetables and countless instruments were invented since then. Another important aspect of the orchestra, is our direct democratic structure. Since it was founded as a projects of friends, we kept it that way, everybody makes decisions and has the same responsibility. And that’s also how our music works: our instruments are very limited, but together it’s complex music. Two aspects of the work with the orchestra have inspired me a lot: the first is “limitation by choice to find new ways of doing things” ( – in other words “the search for the inherent richness within restricted fields”). I still feel like my focus on the acoustic multiphonic bass clarinet bears a lot of possibilities in the future. The other aspect is my general interest in artistic collaborations without a chief, in other words theory and practice of collaborative work processes. To what extent has your playing been influenced by jazz (free jazz) and do you have anyone you admire from that field? Improvisation is a very important principal approach for my work. But when I play improvised concerts, I still am very interested in a big variety of expressions and musical styles. I call it multi-idiomatic improvisation. “Free Jazz” is very often handled like a historic genre, I am just as interested in this style, like I am interested in many other styles. But certainly there are many many impressive and inspiring figures in the wide field of improvised music, who went their very own way. Listen to a radio special featuring Gartmayer’s music on Resonance FM. What does experimentation mean to you – and how do you approach it in your various projects? On one side, experimentation means focus. If you have all the possibilities in the world, you might never find new ways for/of X or Y. Experimentation means also an improvisational approach to me, only when you accept that you can´t control everything, will you get unexpected results. Also, I try to have my patterns of thinking reviewed sometimes. Don´t ever trust yourself too much! You are based in Vienna. Can you talk about the city’s active improv and music scene that you are part of? I like the not overwhelming (size-wise) but still lively music scene in Vienna. There are even various improv/experimental circles, that partly dissociate them from each other. It’s great that one may take aesthetic discussions that seriously! And this also speaks for the still quite positive climate for arts and culture in the city. I like, that there are several series and festivals for experimental music and art here. Sometimes it can also get innervatingly cushy, lazy and slow here (- there’s a saying that everything happens 20 years later in Vienna). That’s when it’s wonderful that my life and art gives me the opportunity to travel and get to know other places and ways of living.